Since the establishment of the first tobacco sales warehouse in 1871, this industry has grown every year more important. 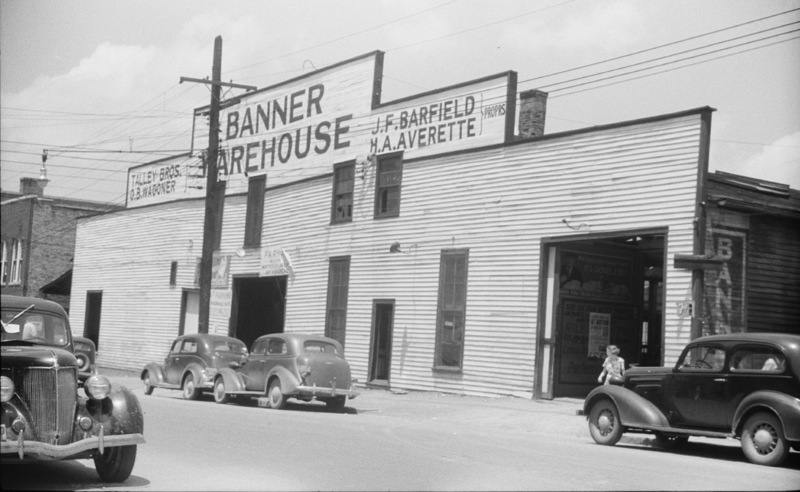 In 1903, JA Warren and Maynard Mangum established their business at the Banner Warehouse, and it has become an important center in this great industry. The building is a large frame structure 120 by 200 feet in dimensions, and is conveniently situated at 212- 214 Watkins Street. Every accommodation is afforded growers and planters, and with ample floor space for the display and sale of thousands of pounds of leaf, this is a popular spot with a large number of the planters of this district. Sales, which, are held daily, are attended by representatives of all the largest tobacco buyers-many out of town manufacturers and dealers having their buyers here. the year around. This insures a lively competition, and as a result prices are the best. Both partners of this business are prominent in Durham's commercial circles. J. A. Warren is Cashier of the business. and is interested in many of the city's most important enterprises. Maynard Mangum, the Sales Manager been resident here since 1892, and is an experienced man in the tobacco trade. He is himself an expert judge of leaf and knows the warehouse business clear through, from top to bottom. He has the reputation of securing for his customers the best possible prices, and he holds the respect and confidence of both grower and buyer. The north side of Morgan St. east of Foster St. was the southern extent of the early 20th century tobacco warehouse district, which extended northward along Rigsbee Ave. Above, looking north-northwest, 1924. Rigsbee and East Chapel Hill St. are in the foreground, and Morgan St. is the next east-west street to the north. 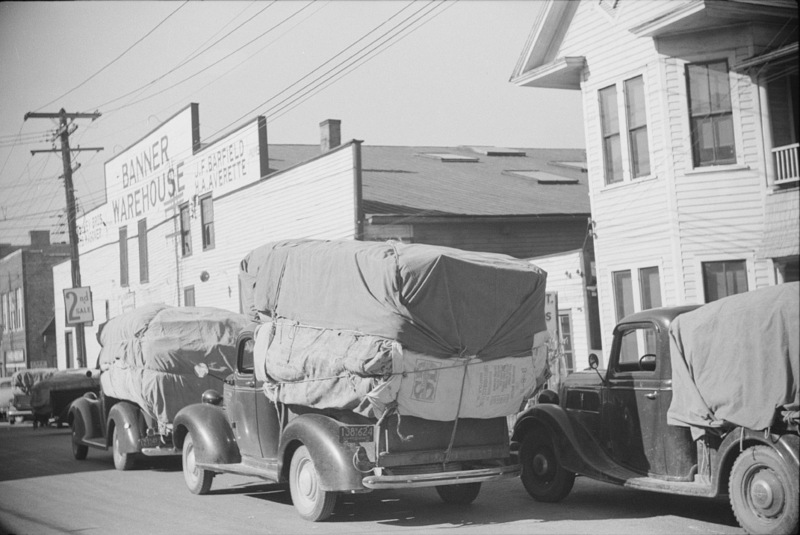 Two large warehouses are to the west of Rigsbee Ave., separated by two small houses. One is labelled "Cozart" and "Big 4" - the other is the Banner Warehouse. 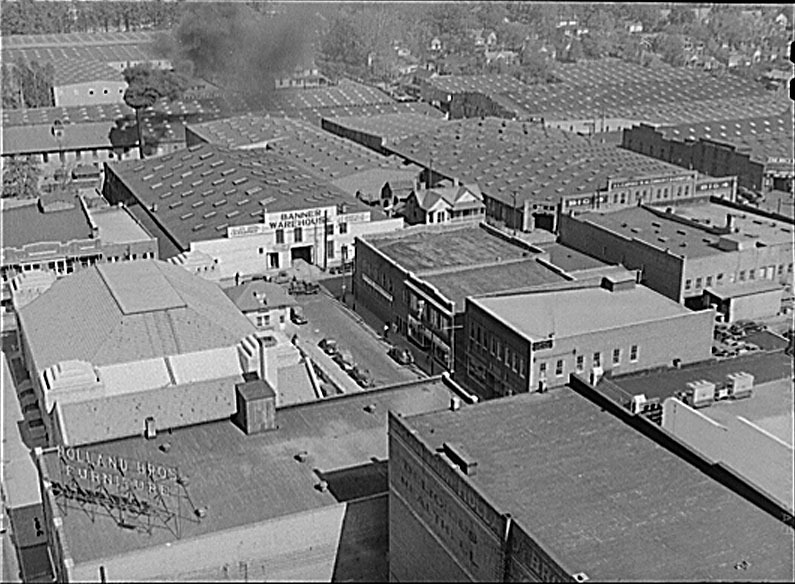 Another view of the warehouse district, significantly expanded, 1940. According to newspaper accounts, around 9pm on July 8, 1944 a fire started in the the basement of the Big Four warehouse, where furniture was being stored. In less than three houses all but one building remained in the block - $250,000 in downtown property was destroyed. According to Charlotte Observer, July 9, 1944, "Other establishments burned to earth included the Central leaf redrying plant and the Dillard livery stables, where 12 cows and four horses burned to death." Above, the view from ~Seminary St. looking south. The structures on the south side of the 200 block of Morgan St. are visible beyond the burned structure. Sometime during the 1950s-early 1960, two car related businesses, Midtown Motors and Goodyear, opened on the site. 212-222 Morgan, looking northwest, 1966. These were still in operation in 1987. Looking northeast from the Hill (CCB/Suntrust) Building. Midtown motors was torn down during the 1990s, and the Goodyear building persists in a more eye-catching form.